What a clever idea to raise awareness while raising beneficial plants. If you’re not a Texan, maybe you can get an equivalent program rolling for your state next year. 1. Plant five or more species of plants (annuals, perennials, shrubs, vines, trees). 2. Plant at least three plants of each species. 3. Use no pesticides or herbicides. 4. Plant large patches of the same species close together. Try for a minimum 4′ by 4′ patch of each species. 5. Plant a variety of species that will provide blooms throughout the spring, summer, and fall. 6. Plant bee-friendly plants. 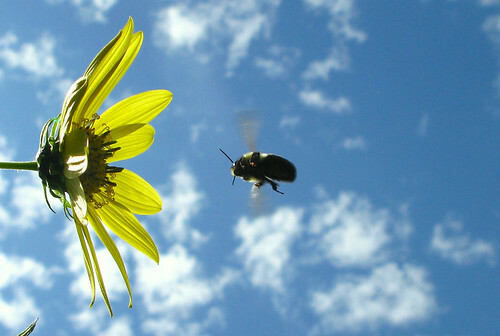 Native plants will attract a greater diversity of native bees, but during the hot Texas summer months, planting non-native plant will also help the native bees make it through the summer. 7. Provide nesting areas (bare soil and/or nest boxes or bundles).